What a busy week it has been, I had no time (somehow) to update my blog and even my instagram. You know how much a torture it is to have the photos ready about a new place, but you just don't have the time to write down about it. It's like trying to balance an egg at the tip of a sharp rock! 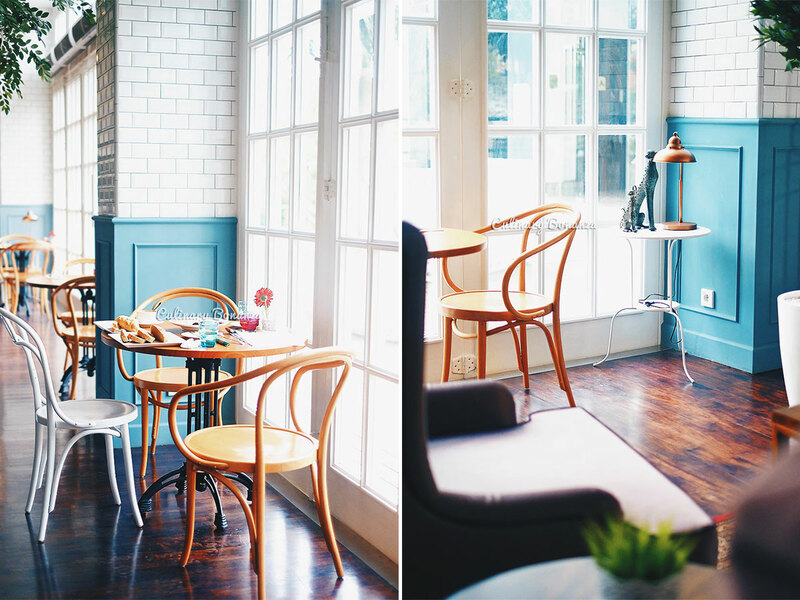 LOL, sorry, was exaggerating, but anyway, now that I get to sit down and have more time to write, I'm going to share with you about this lovely brand new cafe / restaurant in South Jakarta. Wyl's Kitchen, named after one of the restaurant owners, who's also the chief Chef here, is located at Veranda Hotel, in Pakubuwono area of South Jakarta. 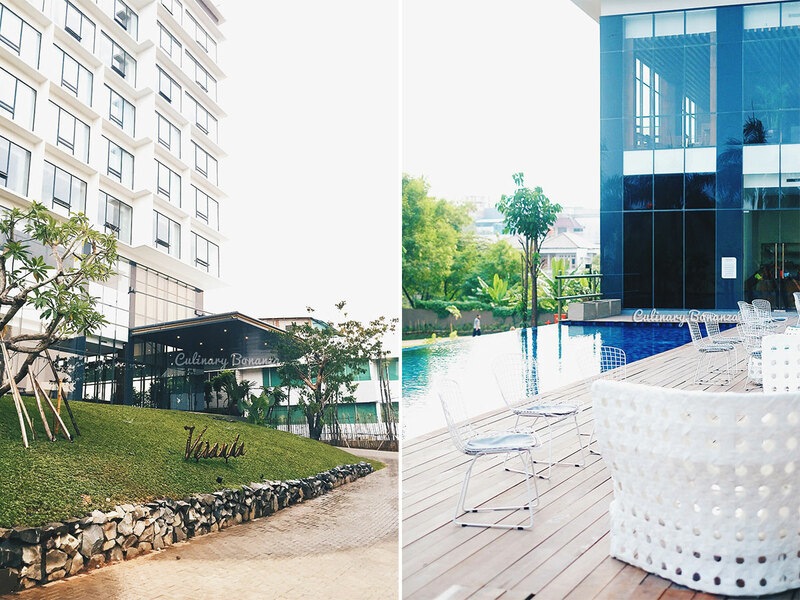 The hotel is a local brand of new business hotel that just recently opened on 20 May 2015. On its website, it seems like the brand is expanding with another hotel at another location in West Jakarta, as well as a few residences projects in the future. 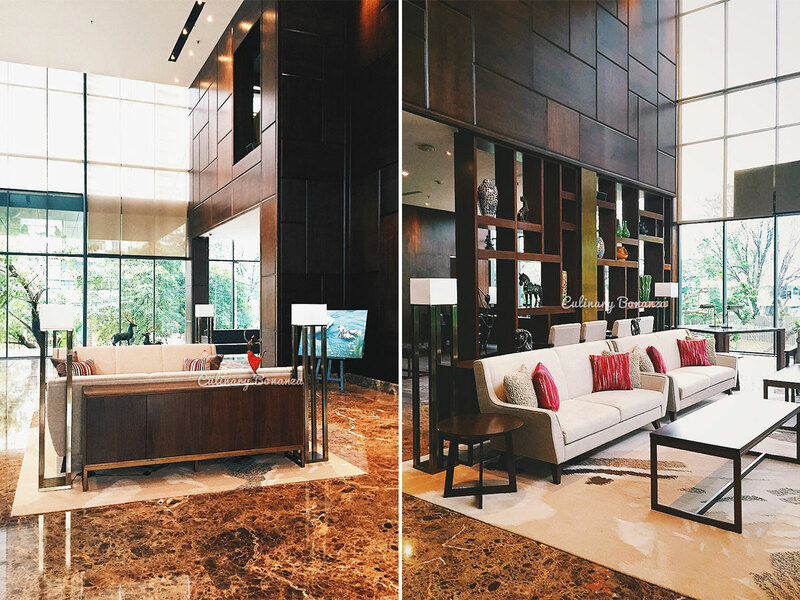 Here's a little preview of the hotel's shiny brand new lobby. 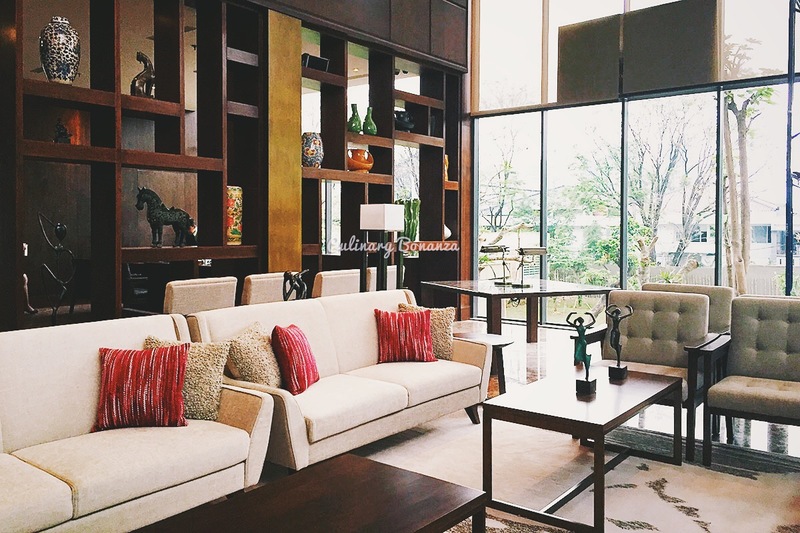 It's a simple & sleek modern feel, with art pieces and paintings scattered around. Actually the paintings are actually the masterpieces of incredibly talented, handicapped artists from the Association of Mouth and Foot Painting Artists (AMFPA - Indonesia). This is the hotel's exterior, one is the main entrance and the other is the exterior from the swimming pool side. Stepping inside Wyl's Kitchen is like entering a spacious, bright and homey kitchen, only there are more tables and chairs than a normal house would have. I love the white and blue walls, as well as the white dominant elements in the entire place. Although the tables are a little too 'reddish' to my liking (somehow it makes the colour of the food pale in comparison against such a striking surface, but anyway, that's just me). And you could already guess, with just one look at the photos, which table would be my favourite spot: yep, it's none other than the tables by the window, overlooking the infinity pool! Oh well, before I got you over excited about the pool, allow me to correct your imagination, the pool is on the 1st floor, so the infinite-ness is not comparable to the infinity pool situated 56 floors above ground (I'm referring to Marina Bay Sands - lol). But anyway, once the landscape on the ground floor is completely done, it'll be a lovely green sight, awaiting at the other end of the pool. Wyl's Kitchen, according to Chef William, tries to present Asian with focus on Indonesian cuisine as a casual, easy to eat and yet always makes us yearn for it. However, as it is a business hotel after all, there will be some classic western dishes on the menu as well. Wyl's Kitchen is also the only restaurant at Verand Hotel, so in the morning, this is where the hotel guests have their breakfast. Firstly, we started our feast with the Signature Beverages: Avocado Orange Butter Scotch & Hazelnut Nutella Coffee. I was not usually into 'modern' coffee, but this delicious treat was quite irresistible. As for the avocado orange, it's pretty much like avocado juice, served with orange rinds on top, and you're not supposed to sip it using the straw, so you could smell the orange scent while sipping it. For Appetizer, we tried the Pear & Jako Fish in Rice Paper Roll - fresh sliced pear, minced bratwurst, green apple julienne & avocado, rolled in fresh rice paper, garnished with jako fish and red onion salsa. Signature Food: Fried Beef Ribs with Garlic & Ginger Timbel Rice - tender fried beef ribs, pan-seared green chili sambal, served with garlic & ginger rice in banana leaf cover, prawn crackers & warm soup. 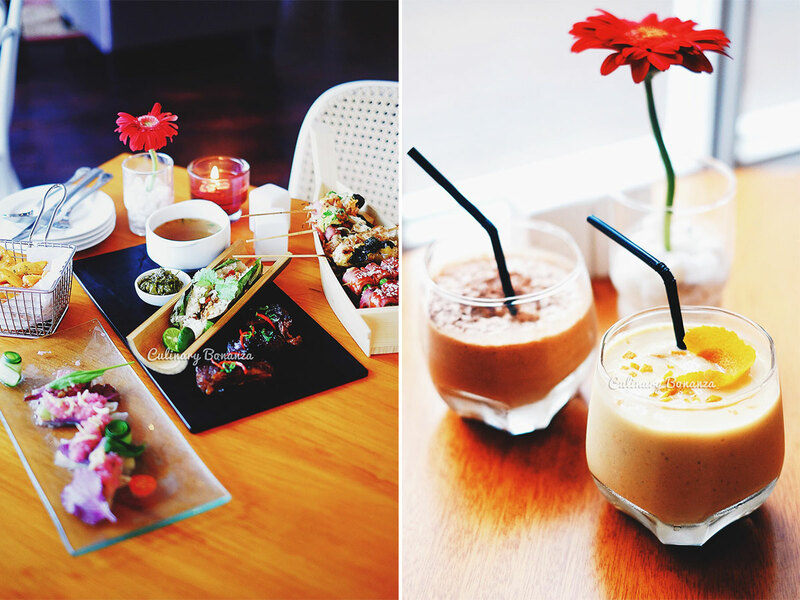 There are 6 Signature Dishes at Wyl's, and they are almost all Indonesian, except for 1 Japanese. I love this dish, because it's surprisingly very affordable (even for a shopping mall standard) and secondly, it suits my Indonesian palate, you know the insatiable demand for bold flavours and fragrant food. This dish has it all on a prettily plated ensemble. Another Signature Food would be the Smoky Assorted Yakitori Platter - 4 kinds of grilled yakitori: asparagus bacon, chicken tsukune, miso cod fish and mix vegetable (2 pieces of each) on a sampan boat! Cute presentation, right? And then, there's the Western Main, for which we tried the Rib Eye Steak with Mashed Potato. 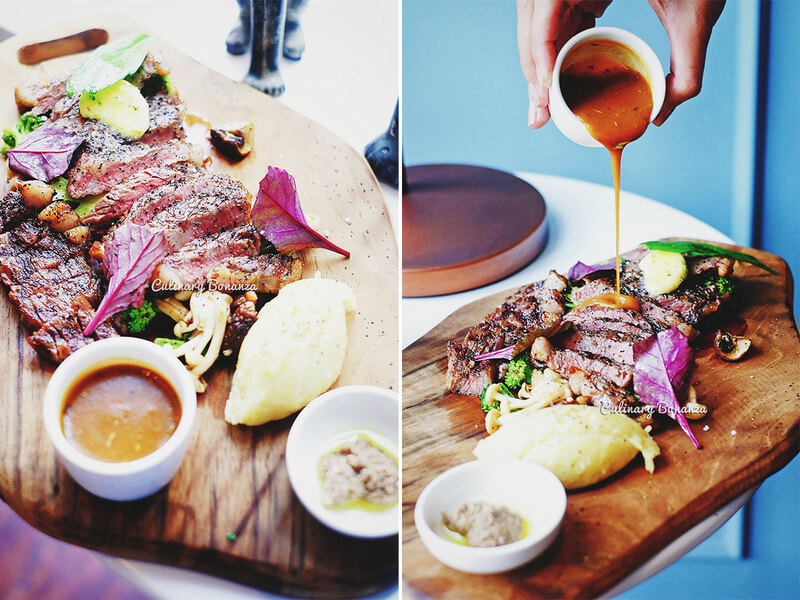 But really, the beautiful wooden plate hold more than just those two, 220gr thinly cut slab of rib eye steak, grilled to medium perfection, a glob of lovely mashed potato, grilled mushrooms, broccoli and served with white truffle paste and delicious brown sauce. Never had a steak served with real truffle paste at such price, it's a real great deal! Lastly, for dessert, we had the Espresso Pannacotta. It's a lovely platter of delight, pannacotta, coated with crunchy almond and peanut crumbs, served with chocolate ice cream, salted caramel sauce and caramelised banana. If you feel like trying Indonesian dessert, there are Pandan Sum Sum or even Cendol Durian to satisfy your sweet tooth! In conclusion, I truly enjoyed my meal here, and I look forward to coming back, and I'd like to encourage you to try this place too, be a hipster, get away from the shopping malls! LOL. New Uber-Adorable Japanese Cafe: Itadakimasu!